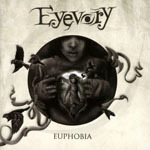 Share the post "Album review: EYEVORY – Euphobia"
Rob Reed might think that with Magenta’s latest offering that he’s produced a prog album with a capital P. But Bremen based Evevory’s debut long player shows that in prog terms, Teutonic build quality exceeds that of just about every other country in the western world (including Wales). And Germany has always had a real ‘soft spot’ for prog where bands like Gentle Giant have achieved a longstanding appreciation that seems to have outlasted and outstripped that on home soil. They know what they like and like what they know. And not just the stashes of 1970’s vinyl in their wardrobes. Which brings us to Eyevory, a home-grown four piece with a core of Jana Frank – vocals / bass, Kaja Fischer – vocals / flute / keyboards, and David Merz on guitars. Sascha Barasa Suso sits behind the kit on the album, although the position is currently vacant. OK, flute isn’t unusual in being a prog front instrument and naturally there’s hints of Tull and Focus. But equally there’s hints of Camel and dare we say it, pop. Not to mention they throw everything from techno, hip-hop, scratch to space rock into the mix. Having two ladies in a seriously proggy outfit is also unusual feature, but make no mistake, they’re not just eye candy. The vocals, flute, keys combination is more eye-catching than Thijs Van Leer, and the complicated rhythm patterns show that Jana Frank is no slouch when it comes to bass runs. Complemented by some sterling fretwork from Merz, it all adds up to a breathtaking melee that requires a good few listens to familiarise the many twists and turns before full appreciation begins to dawn. In some ways I was reminded of elements of Doris Brendel’s fronting of The Violet Hour, and those other Dutch 1970’s proggers Earth And Fire. This entry was posted in ALBUM REVIEWS, ALBUM REVIEWS (Mobile), All Posts and tagged album, Euphobia, Eyevory, German, Germany, melodic, pop, prog, progressive, review, rock. Bookmark the permalink.